AK47/74 Upper and Lower Handguard with Rail. 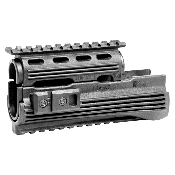 Our Products >> AK47/74 Upper and Lower Handguard with Rail. Polymer two piece handguard provides a rigid lightweight platform to mount Picatinny accessories.